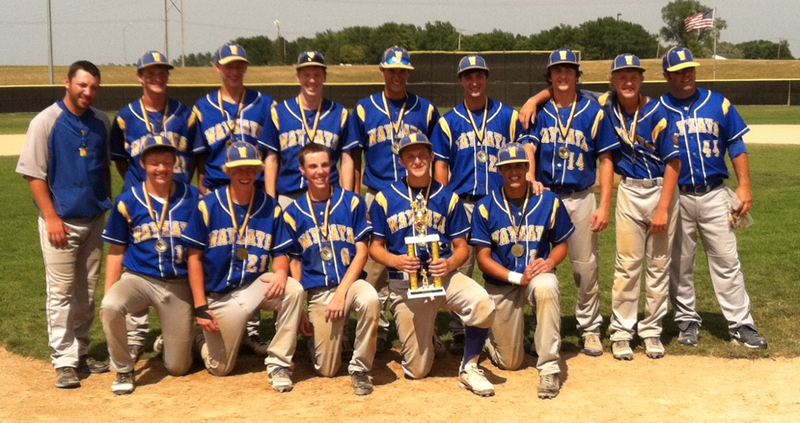 The Wayzata Jr. Legion team finishes the regular season with an exclamation point by winning the Sioux Falls Classic in Sioux Falls, SD this past weekend. The team rolled through pool play with wins over South Sioux City, IA, Brookings, SD, and Sioux Falls South. They then faced cross-town-rivals Hopkins, MN in the semi-finals. Wayzata beat Hopkins in nine innings 7-6 to advance to the championship game. In the championship game, Wayzata faced the host team Sioux Falls West and won 13-1 in five innings. The team played great and is now gearing up for post-season play. Wayzata’s current overall record is 28-7, finishing 10-6 in South Suburban League play, earning the #3 seed in the 2012 Minnesota Jr. Legion State Tournament in Eagan, MN starting next Tuesday, July 24th verses St. Croix Lutheran at 6 pm at Eagan High School Varsity Field. Wayzata’s accolades this season also include a runner-up finish in the Apple Valley Tournament, and championship titles in the Burnsville, New Ulm, and Sioux Falls tournaments.